It seems like the calamities keep coming at such a daunting clip these days, before you can digest the scope and severity of one, another comes up and knocks the previous one out of the news cycle. Even then, the gravity of devastation and loss of life in the “Camp Fire” in California that completely destroyed the town of Paradise is something like we’ve never seen, and may take months to fully assess, while the community has years of healing ahead. Though they never hit the big time or won any major awards, those who are familiar with the legacy of the .357 String Band know they were one of the most important bands in underground roots music history, combining break neck speed, world-class instrumentation, compelling songwriting, and a punk attitude into a string outfit that still to this day is hard to top. There had never been anything like the .357 String Band before, and there probably will never be anything like it again. The band’s album Fire & Hail was Saving Country Music’s 2008 Album of the Year. After the band officially called it quits in 2011, banjo player and songwriter Joseph Huber launched a solo career and remains a critically-acclaimed performer whose records have produced some of the greatest singer/songwriter material in the last 7 or 8 years. Upright bass player Rick Ness landed on his feet as one of the primary cast members of the Discovery Channel’s docu-series Gold Rush, and might be the most well-recognized of the bunch. Mandolin player and songwriter Jayke Orvis went on to have his own solo career and play with The Goddamn Gallows on many tours. Mandolin/dobro player Billy Cook also remains active in music. But guitar player, songwriter, and front man Derek Dunn has been the .357 String Band member that has remained mostly out of the spotlight since the band broke up. Originally from Milwaukee where the .357 String Band was based, Dunn released an EP called Poisonous Serpents in 2014 that worked a bit like an epitaph of his time with the band. He also went on a European tour with the .357-inspired Dinosaur Truckers in 2014 and played a few other shows, but mostly has been retired from music since his .357 days. Instead of trying to slog it out in the music business, Derek Dunn and his partner Kate Connelly began spending a lot of time camping and traveling to various parts of California from Wisconsin. Dunn attended the University of Wisconsin-Milwaukee, and finished his undergraduate degree online. The couple bought an RV, eventually landing in Paradise, California in the northern Sierra Nevada’s after finding a suitable RV park that was hospitable to their dog Pickles, and within driving distance of a community college for Kate to continue to pursue a biology degree. Dunn got an extra shot of inspiration to pursue teaching via fellow underground roots musician Possessed by Paul James, who works as a Special Education teacher in Texas. “Kody Oh from Calamity Cubes showed me the new Possessed By Paul James album, and I found out he was a teacher. Possessed by Paul James was nice enough to return my Facebook message and call me back right before he was getting on stage at a festival somewhere,” says Dunn. Derek Dunn and Kate had finally found their place in Paradise, California. And then tragedy struck. The first evacuations ordered were for the eastern quarter of Paradise. But as the fire drew near, the entire town was evacuated. Paradise, California was completely destroyed in the fire, and the disaster has since been declared the most destructive fire in California history. So far there have been 81 confirmed fatalities, with that number expected to rise, making it the sixth deadliest fire in US history. 153,336 acres burned, destroying 17,148 structures, including 12,637 single-family homes and 118 apartment buildings. Damage estimates range upwards of 10 billion. 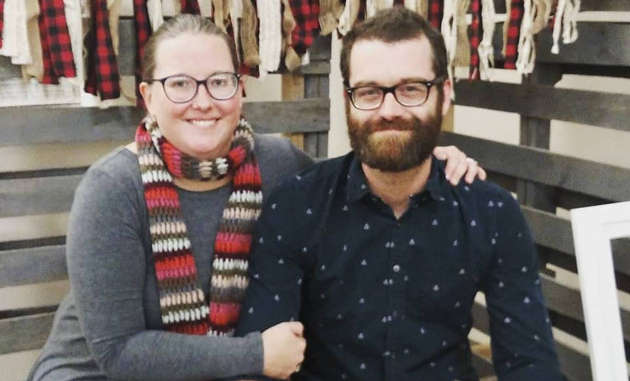 A Go Fund Me page was set up to help Derek Dunn and Katie Connelly get their feet beneath them after the disaster. It quickly surpassed the $5,000 goal thanks to the network of fans that still hold the .357 String Band in fond memory. Derek and Katie have now pledged to take proceeds from the campaign to buy Christmas presents for Dunn’s students. Crazy story and a lot of respect for Derek’s pursuits with teaching! The .357 string band was awesome and I’ve loved all of Jaykes solo music and contributions in the Goddamn Gallows. Not fair when people like that don’t get recognition and you have so many of the same type garbage populating mainstream music. I’ve always wanted to see a .357 reunion aired on gold Rush. Obviously it wouldn’t be a concert but to show some clips on a popular show would introduce a lot of people who would probably be fans to music they don’t even know exist. Come on Rick, make it happen! Great story and article, 357 sb rulez. The same catastrophe happened here in the town of Mati,Greece last summer. 99 people died there in less than an hour. May God give faith and courage to recover.